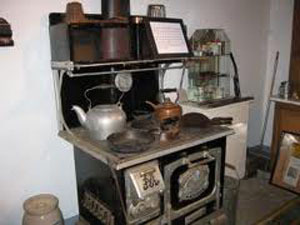 Stove in the museum at the Brown's Point Lighthouse Keepers Cottage. On a recent Saturday I took a tour of the Brown’s Point Lighthouse and Cottage in Brown’s Point, led by Barbara Heimers. She was visiting from the east coast for her niece’s wedding, which was set to take place in a few hours in front of the lighthouse with an up-close view of the beach. To keep herself busy, she deeply researched the lighthouse so she could voluntarily lead the free tours that afternoon and she gladly shared that knowledge with visitors. The Brown's Point art deco Lighthouse. Open Saturdays, between 1 p.m. to 4 p.m. from March through November, these tours cost nothing. Although by now Barbara has returned home, many other knowledgeable guides also lead the tours. 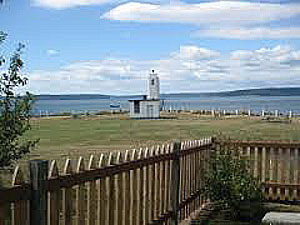 In 1887, a lantern hung from a post at Brown’s Point warning ships that they were approaching the entrance to Commencement Bay. Then in 1903 a wooden light house was built, also to warn ships and it needed a lighthouse keeper. Oscar Brown and his wife, Annie, became the first lighthouse keepers at Brown’s Point that same year. They arrived with a cow and a piano. Their daily tasks included keeping the kerosene light burning and the fog bell ringing (Brown’s Point is one of the foggiest places in Washington, so this was very important), and Oscar kept a journal of daily activities plus gave music lessons to the neighborhood children. In 1939 Oscar retired and the United States Coast Guard took over the Lighthouse Service. At this time almost everything in the lighthouse became automated. A kind of living museum has been established in the basement of the cottage showcasing many of the furnishings of life in the early 20’s times like an ice box, iron, treadle sewing machine and so much more. The three-bedroom Brown’s Point Lighthouse Cottage rents for $800 a week, but guests must take over some of the Light Keeper’s duties – daily maintenance, conducting tours, raising and lowering the U.S. flag and making daily entries into the light keeper’s log book. When people had to help others and everything wasn’t done by computers. Whether you choose to stay in the cottage (available from May – October) or not, a tour is well worth your while. For information or reservations, visit www.pointsnortheast.org. And it’s right on the beach. This entry was posted in Lighthouses, Museums, Towns and tagged Brown's Point Lighthouse, Commencement Bay, Cottage, lighthouse keeper, museum, Oscar Brown on September 16, 2010 by Heather Larson. This looks lovely. The ice box reminded me that my parents always called a fridge an “ice box.” They were Depression era and so all of us kids called it an “ice box” too. That is, until my first full time job when some co-workers gave me grief about it. 🙂 I would love to stay in this cottage.